I have been dying for a post on the music of Libya pretty much since day one. It is one of those countries that stares back at me from the map. Just a big blank. Nothing. Having never even seen a record from there, I figured that I would have someone write a guest post. But something would always come up. E-mails went unanswered, connections missed, and so on until I started to think that it would never happen… Until now! There’s not a whole lot of information available about the music of Libya. The Wikipedia page only talks about Ma’luf, Chaabi and Arab classical music, as well as the music of Tuareg – which is a whole other thing all together. But no mention of modern popular music. In an interview I conducted with Alan Bishop for Chunklet Magazine, I asked him why there was such a lack of music from Libya. His response was: “Libya is perhaps a wrong geographical colonial creation to be judged musically as a nation. The borders or the way Libya was carved give it far less population and therefore, less cultural possibilities to produce as many interesting styles and ideas as Morocco, Algeria, or Egypt – all much more heavily populated and culturally diverse musical powerhouses…”. But that is not to say that there is nothing to be found. Nasser Omar el Mizdawi was born on September 5, 1950 in Tripoli. He studied at the Jamal Eddin Elmeladi Institute of Music there. 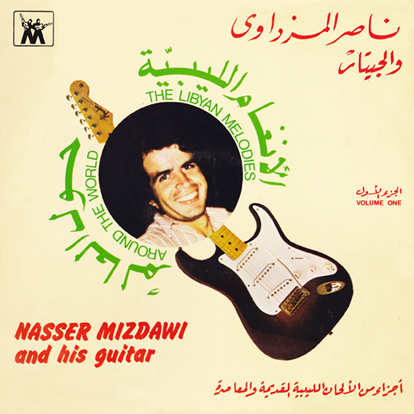 Mezdawi’s first band was called Annusur, which translates to The Eagles. The band released their first album, Ughniyat an Elghurba, in 1975 which went on to become a gold record. Mizdawi’s popularity grew outside of Libya, especially in neighboring Egypt. So popular in fact, that a fellow Libyan – Hamid El Shari – made a career out of doing Mizdawi’s songs, even going so far as to name his band Al Mizdawyia. Meanwhile, Mizdawi was touring the world, playing shows in Europe and both North and South America. But he was also known to vanish throughout the years, to the extent that people thought he was dead – only fueling El Shari’s career. He eventually moved to Egypt in the Eighties to escape Ghaddafi‘s rule. There, he has worked with Amr Diab. Mizdawi’s last live performance was at the Cairo Opera House. Thanks to Azzam Ben Hmeda and Hany Zaki for the information. Catalog number MIZ 2 – MT 10589 on Mizdawi Music, pressed in Greece by EMI, released 1983.